In preparation for our 2-3 week road trips this year I wanted to make several ‘new’ things for the kids to play with that were portable and wouldn’t make a mess in the car. 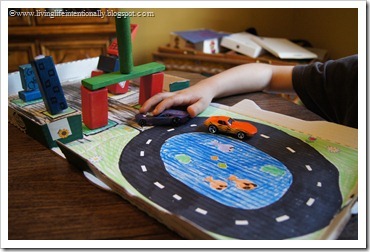 When I saw The Nature of Grace’s Velcro story Block I knew I wanted to make something like it! 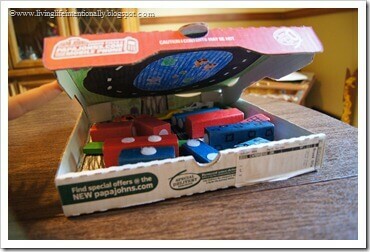 I started with a pizza box. 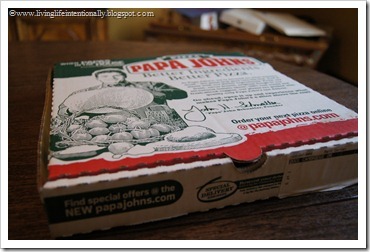 We used papa johns because if you get their plain breadsticks (which we love!) they leave no grease/residue in the box. Goofy helped me design his block town and we put sticky Velcro dots on the block to keep them steady in the car. 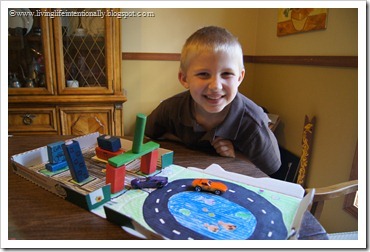 Then we made a around the city & pond. When Goofy is ready to move on to another activity he just pulls the block apart & pays them flat in the box & closes the lid with his blocks & cars right in there. Pretty nifty, huh? Goofy LOVES our creation and is already testing it out before our trip!